I live in Boulder CO, how do I know I need a whole house humidifier system? A. During the fall and winter seasons in Boulder CO it is common for people to get dry skin. A whole house humidifier will humidify your indoor air will to alleviate this issue. Static electricity is also a cause of minimal humidity levels in your home, humidifiers help with that as well. How do whole house humidifiers work with my furnace? A. Whole house humidifiers work by retrieving the supply air air directly from your furnace blower and passes it through a condensing pad that has water dispersing through it. When the hot air passes through the pad it is then returned into the heating duct system as humidified air. There are several different ways a residential whole house humidifier works but essentially they all use this method. How often should I use my furnace humidifier? A. Your furnace humidifier runs only in the winter with your furnace. Every home is different and each home set to a different percentage of humidity. Typically it is any where from 25% up to 45%. You know when there is too much humidity when your home windows begin to bead up with water. Some Colorado houses with a lot of wood floor area and furniture require a higher humidity rating because the wood tends to “soak up” the humidity before you can feel it in the air. What is the difference between a typical house humidifier and a steamer? A. The only difference is the steamer introduces a jet of steam into the home heating duct system when your furnace is running. 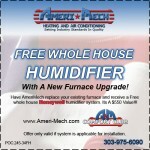 As opposed to traditional home humidifiers which rely on condensing pads to introduce humidity into the heating system. Also, on most steamers a power source is required while humidifiers run off the low voltage from your furnace.